We've stayed at the Woodland Park campground in Grand Marais and Tahquamenon Falls State Park near Paradise, Michigan. 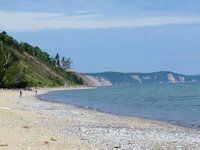 Woodland Park has a great location, convenient to Pictured Rocks National Lakeshore and within walking distance of downtown Grand Marais. It is a very good park for RVs, with full hookups and dump station, at a very reasonable price considering its prime location. Tahquamenon Falls has a very nice network of hiking trails, attractive waterfalls, and modern campground facilities. One of the nicer tent camping spots in the eastern Upper Peninsula but also well suited for RVs. 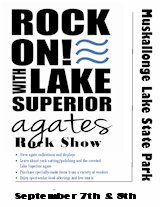 We've also stayed at Muskallonge Lake State Park during the Agate Festival. It has a nice location sandwiched between Lake Superior on one side and Muskallonge Lake on the other so you get the advantages both offer. Closer to Sault Ste. Marie is Brimley State Park. And in the Soo is the Soo Locks Campground. 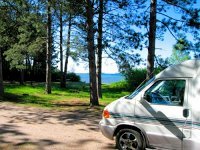 For campers willing to handle driving on unpaved roads and more rustic campsite amenities, there are several state and national forest campgrounds available. Tahquamenon Falls is one of the largest waterfalls east of the Mississipi, more than 200 feet across and a drop of nearly 50 feet. The park offers three modern campgrounds, with electric hookups, hot showers, and a table and firepit at each camp site. Recreational activities include hiking, fishing, canoeing, and nature study. Tahquamenon Falls Brewpub is located in the woods near the upper falls. 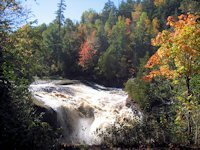 During the fall season, you'll find some of the best fall foliage color in the eastern UP at Tahquamenon Falls. Located on Lake Superior adjacent to the eastern portion of Pictured Rocks National Lakeshore Park. Its expansive sand beach offers fine beach combing and rock hunting, including agates. It is within walking distance of downtown Grand Marais. Facilities include over 110 camp sites (most with electric and other hookups), a recreation area and picnic grounds, two bath/shower houses, and a dump station. Better suited for RVs but there are a few nice tent camping sites on the western end of the park. 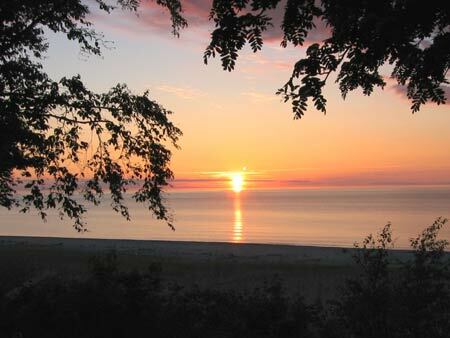 Pictured Rocks National Lakeshore offers three campgrounds: Little Beaver Lake, Twelvemile Beach, and Hurricane River. All have water, tables, grills, and vault toilets (but no showers or hookups). Little Beaver is reached via an unpaved road; the road to Hurricane River and Twelvemile is paved. Little Beaver is for tent camping, not well suited for RVs. 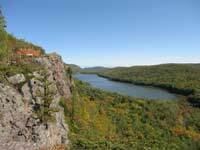 Muskallonge Lake State Park is located 28 miles northwest of Newberry in Luce County. The 217-acre park is situated between the shores of Lake Superior and Muskallonge Lake and the area is well known for its forests, lakes and streams. 170 modern campsites, many with electric hookups, and two shower and toilet buildings. Muskallonge Lake Park is the site of the annual Lake Superior Agate Festival.